Inflammation is a complex process that accompanies and aggravates many chronic pathological conditions, such as arthritis, asthma, atherosclerosis, and many others. Our studies indicate that the various cellular mechanisms and biological signals involved in inflammation can be naturally controlled by a combination of vitamins, amino acids and selected bioflavonoids acting in biological synergy. Inflammation is the body’s response to a tissue injury or an invasion by foreign agents, such as viruses, bacteria and other microorganisms. It is a protective mechanism that our body uses to remove the pathological agent and initiate tissue repair. However, this is a temporary mechanism and inflammation can turn into pathology if it becomes excessive and chronic. Long lasting inflammation can trigger cascades of various biological signal responses which initiate abnormal cellular activities in neighboring tissues and cells leading to damage of healthy cells and tissue. 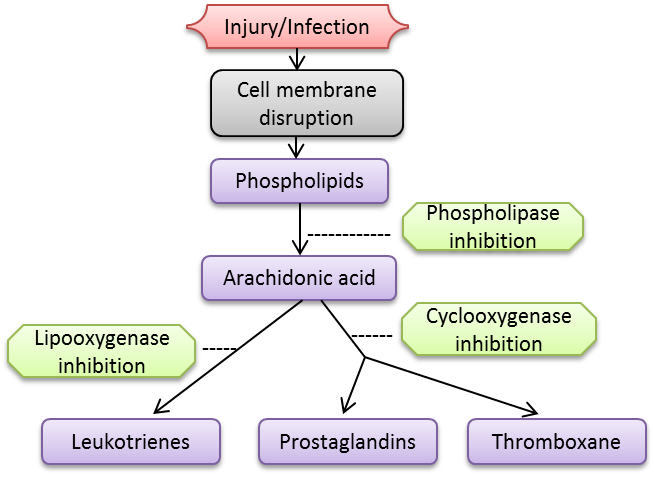 The process of inflammation involves a variety of locally produced molecules. These so called inflammatory mediators include substances which are present in our blood plasma such as the enzyme plasmin and other components involved in blood coagulation and histamine release. There are also cellular mediators released by the white blood cells and they include various substances such as leukotrienes, prostaglandins, cytokines, interleukins, and many others. Many anti-inflammatory drugs function by preventing the formation of those mediators or by blocking their actions on the target cells whose behavior is modified by the mediators. Inflammation can occur suddenly as an acute reaction, such as a response to injury. The symptoms are heat, redness, swelling, and pain in the affected area. Inflammation can also persist for a long time in relation to lasting infection, ulceration, irritation or autoimmune disease, and can become a chronic process. Such inflammation is often the foundation for many chronic degenerative diseases that take years to develop. Chronic inflammation in the joints leads to arthritis, in the membranes around the heart to pericarditis, and in the stomach it causes gastritis. Inflammation accompanies chronic pain, asthma, multiple sclerosis, atherosclerosis, cancer, and many other diseases. Conventional medicine: Patients suffering from inflammatory disorders often take painkillers in order to alleviate the pain. While these drugs can decrease the suffering from pain, they do not eliminate the cause of the inflammation. Treatments that target inflammation involve the use of synthetic steroids and a family of “non-steroidal anti-inflammatory drugs” (NSAIDS) both of which have many undesirable side effects. NSAIDS are widely used especially for a variety of muscle and joint problems. These drugs inhibit the enzymes that are necessary for the formation of prostaglandins. While they may help in relieving symptoms they also have negative health effects. The most serious and life threatening side effect of NSAIDS are gastrointestinal complications, such as bleeding. A new class of drugs called COX2 inhibitors (such as VIOXX) was not associated with this problem; however, VIOXX was taken off the market because it increased the risk of death from heart attacks. Cellular medicine research: Various scientific studies have shown that proper nutrition helps in controlling inflammation and that some micronutrient deficiencies (i.e., vitamin A) can aggravate inflammatory responses. The focus of cellular medicine research has been not so much on individual natural components, but on developing nutrient synergies that can address various pathological processes at the cellular level. By using specifically selected nutrients many processes can be affected simultaneously and their synergy allows achievement of superior effects with lower doses of individual nutrients. We have documented the anti-inflammatory effects of a micronutrient mixture composed of vitamin C, various amino acids, and green tea phenolics, in human aortic smooth muscle cells. These findings are important in relation to inflammation processes associated with the progression of atherosclerosis. In addition, we have demonstrated in vivo that a mixture of selected micronutrients enriched with citrus flavonoids such as hesperidin, naringinin and quercetin, was effective in a significant reduction of various inflammatory mediators and cytokines in systemic inflammation. The results have shown that micronutrient supplementation provided better protection against inflammation than ibuprofen and it resulted in reduced expression of COX2 and various other inflammatory cytokines. It is important to note that while pharmaceutical COX2 inhibitors carry a risk of life threatening side effects, micronutrients are safe and provide additional health benefits.